Today I want to look at the life of Delacroix and a couple of his paintings. However I am not talking about Eugène Delacroix but the artist Henri-Edmond-Joseph Delacroix who was born in Douai a commune in the Nord département in Northern France, in 1856, some fifty-eight years after the great French Romantic painter. Henri-Edmond-Joseph Delacroix was the only surviving child of a French father, Alcide Delacroix and a British mother, Fanny Woollett. The family moved to Lille when Henri was nine years of age. He showed an interest in drawing when he was young and his parents sent him to Carolus-Duran, the Lille painter, for private drawing and painting lessons when he was just ten years of age. He was encouraged as a youth to develop his artistic talent by his father’s widowed cousin, Dr Auguste Soins, who paid for much of Henri’s artistic training. He spent a short time in Paris when he was nineteen, studying under the tutelage of the French realist painter, François Bonvin before returning to Lille. In 1878 he enrolled on a three-year course at the Écoles Académiques de Dessin et d’Architecture in Lille and studied under the painter, Alphonse Colas. Three years later he returned to Paris and studied in the atelier of Émile Dupont-Zipcy. Henri began exhibiting his work in 1881 but so that he and his work would not be confused with the late romantic artist Henri-Eugène Delacroix he decided to change his name to “Henri Cross” which was a reduced English version of his surname (croix). In 1886 he changed the signature on his paintings to Henri Edmond Cross so that there would be no confusion between him and the glass paste sculptor Henri Cros. Henri Cross’ artwork changed in 1883 after travelling south to Provence and meeting up with Claude Monet. His early works which had been mainly realist portraiture and still-life works had been predominately dark in colour but suddenly it all changed and his paintings took on the lighter colours and tones of the Impressionists. The following year, 1884, was a milestone in French art. Up until then any artist wanting to progress in their chosen career relied completely on having their works exhibited at the Paris Salon and for that to happen they had to submit their paintings to the Salon jurists to see if they considered their works good enough to be exhibited. The jurists were, at this time, increasingly conservative in their views of what art was acceptable and were not receptive to the works proffered by the Impressionist artists whose works had moved away from the traditional academic style. The Impressionists would often have their paintings rejected by the Salon jurists or if they did manage to have a paintings accepted it would be hung in such a way that it was almost hidden from view. In 1863 the jurists rejected a surprisingly high percentage of paintings and this caused a furore amongst the “discarded” artists. The following summer a number of these disgruntled artists, such as Seurat, Signac, Albert Dubois-Pillet, Odilon Redon and today’s featured painter, Henri Cross, got together and formed the Société des Artistes Indépendants (Society of Independent Artists) and based the society on the premise sans jury ni récompense, (No jury nor awards). They held their own inaugural exhibition, Salon des Indépendants, in May 1884 and Henri Cross exhibited some of his paintings. In 1888 he visits the Cote d’Azur for the first time and paints in Eze and Nice and it is in this year that he meets Irma Clare, the subject of today’s paintings. In 1891 he became Vice-President of the Society. He had by this time become one of the leading figures of the Neo-Impressionism movement. Henri Cross’ health was poor and he suffered badly from rheumatism. He decided to move to the warmer climes of the South of France. He initially settled in a rented house in Cabasson, near Le Lavandou, but later went to live in Saint-Clair, a small hamlet just outside of St Tropez, where he stayed for the rest of his life, except for his two visits to Italy, when he journeyed to Tuscany and Umbria in 1903 and 1908 and his trips to Paris to the annual Salon des Indépendants. Paul Signac followed him south the next year and settled in St Tropez. It was during this period that Cross was introduced to the revolutionary artist, Henri Matisse. Henri Cross’ close working relationship with Paul Signac, led to him being introduced to the artistic technique, known as pointillism. Pointillism is the methodical and scientific technique which juxtaposed small dots of pure colour together to maximize luminosity. The dots appear to intermingle and blend in the observer’s eye. My Daily Art Display featured painting today was completed by Henri Cross in 1891 and is housed in the Musée d’Orsay. 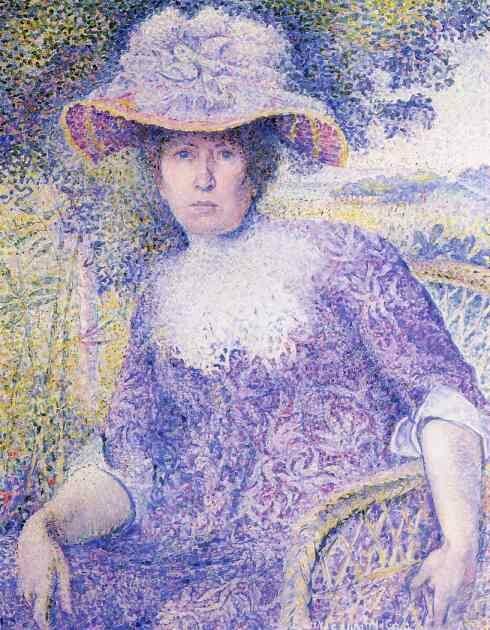 It is entitled Madame Hector France (Portrait of H.F.) and is a fine example of the artist’s use of the pointillism technique with its screen of small regular dots over a densely painted ground. Henri Cross exhibited the work at the Salon de la Société des Artistes Indépendants in 1891 and was looked upon as his first major work which adopted the Neo-Impressionist style. In the foreground we have a mottled pink and white rhododendron which, along with the way the artist has depicted the chair at an angle and the receding floor tiles, gives the painting added depth. As we have seen in paintings I have featured by Monet and other Impressionists, the Japanese influence had taken hold in late nineteenth century France and it is more than likely that the floral display we see in this painting comes from the influence of Japanese prints which were all the rage in France as does the frieze of white Japanese fans we see in the middle-ground. 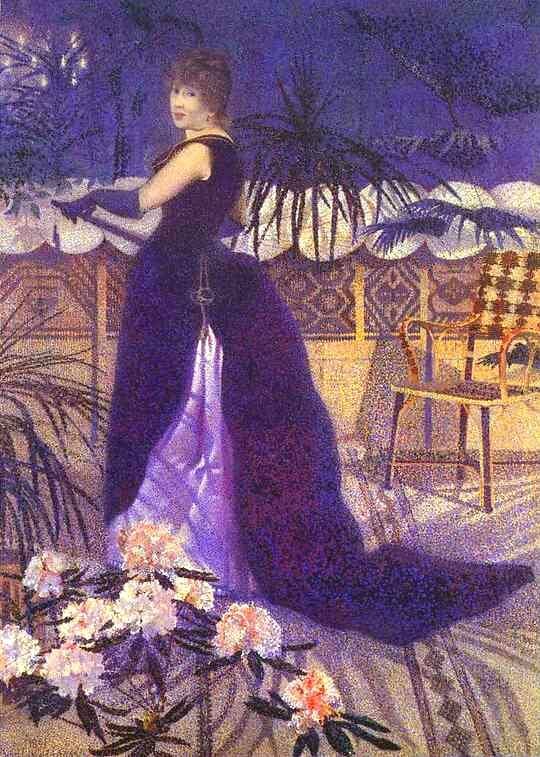 In May 1893, two years after the painting was exhibited, Mrs Hector France became Mrs Henri Edmond Cross, the wife of the artist. For some people the coupling of the two was a coupling of opposites. He was looked upon as a secretive man who was always serious whereas Irma was seen as more frivolous, high-spirited and somewhat shallow. They lived in Saint-Clair and one of their neighbours was the Belgian Neo-Impressionist painter, Théo van Rysselberghe and his wife Maria. She was unequivocally critical of Irma. In the biography Henri-Edmond Cross: études et l’oeuvres sur papier by Françoise Baligand, Raphaël Dupouy, and Claire Maingon, she is quoted as describing Irma as “petty, base of nature and an idle gourmand”. This was not the universal opinion of her as others such as the French artist and friend of the couple, Charles Angrand, found Irma very hospitable and during the latter part of Henri Cross’ life, a very caring person as far as her husband was concerned. Once settled and living around St Tropez, Henri Cross turned more and more to landscape painting using vivid colours but he would still complete the occasional portrait of his beloved wife as was the case in 1901 when he completed the work entitled Portrait of Madame Cross, seated in the garden, looking slightly older, bedecked in a large hat and a floral gown. This painting is also housed at the Musée d’Orsay. By 1907 Henri Cross’ health deteriorated. His eyesight was being affected by the eye disease iritis and his arthritis was becoming more debilitating. In 1909 whilst visiting Paris he was diagnosed as suffering from terminal cancer. He returned home to Saint-Clair and died in May 1910 aged 54. Henri Cross is buried in Le Lavandou. Very nice. I didn’t know him. Pointillism produces works that are interesting up to a point. In other words, Seurat, for example: one can see he was mainly interested in the process of visual perception and was preoccupied with the technical aspect of arriving to a certain frequency of the spectrum blending the dots of different colors. Cross does the same, but manages to give the painting depth; and lets you go beyond the mere laying of the dots on the surface of the painting. Thank you. I’ve truly enjoyed browsing your blog posts. In any case I’ll be subscribing to your feed and I hope you write again very soon! Next Next post: Ruth in Boaz’s Field by Julius Schnorr von Carolsfeld.